Where you live can have a significant impact on your health. Unfortunately, not every American has easy access to the care they need. I covered this topic in a recent blog post, where I analyzed the distribution of radiation oncologists across America to see where access to radiation therapy varies. While that analysis looked at the number of practicing radiation oncologists for metro areas, it didn’t include how far patients are traveling to see those doctors. As part of my exploration, I looked for a way to visualize health care “deserts” — essentially highlighting the absence of doctors. 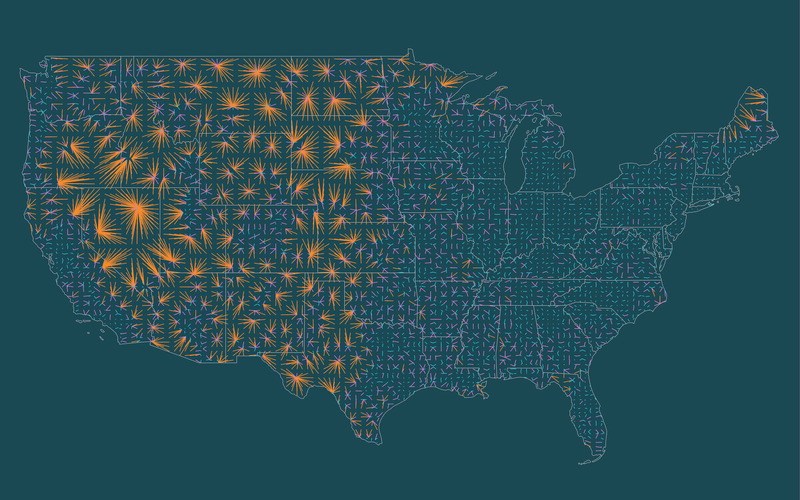 Inspired by a post I saw on FlowingData, I created the maps you see here. All of this data comes from Amino, a service that lets you find and book appointments with doctors who have the most experience treating people like you — powered by a database that covers 893,000 doctors in America. 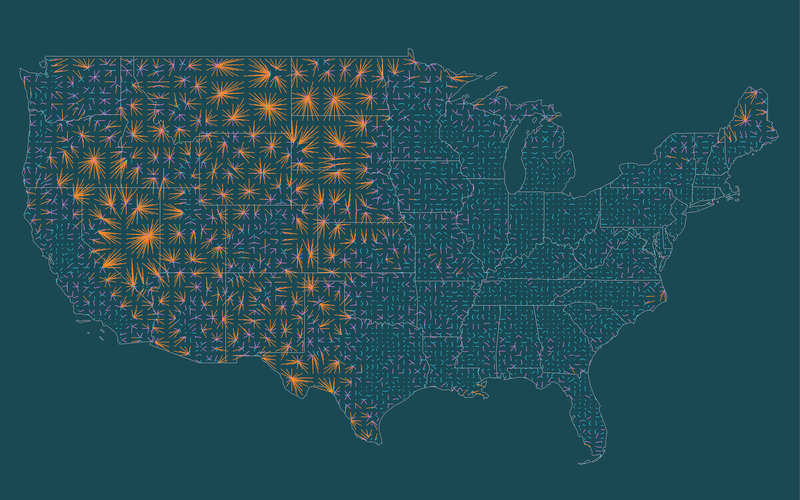 The visuals show what thousands of searches on the site would look like if they were conducted at regular intervals, every 20 miles, across the continental US. At each interval, I drew a line to the nearest location where a doctor practices. Lines that are less than 15 miles in length are colored blue. Lines that are between 15 and 30 miles in length are colored purple. Lines longer than 30 miles are colored orange. I narrowed my analysis to OB/GYNs, radiation oncologists, and emergency medicine doctors, which represent a mix of common and rare physician specialties. Smooth plains of short, blue lines indicate areas where health care is relatively accessible and evenly distributed. 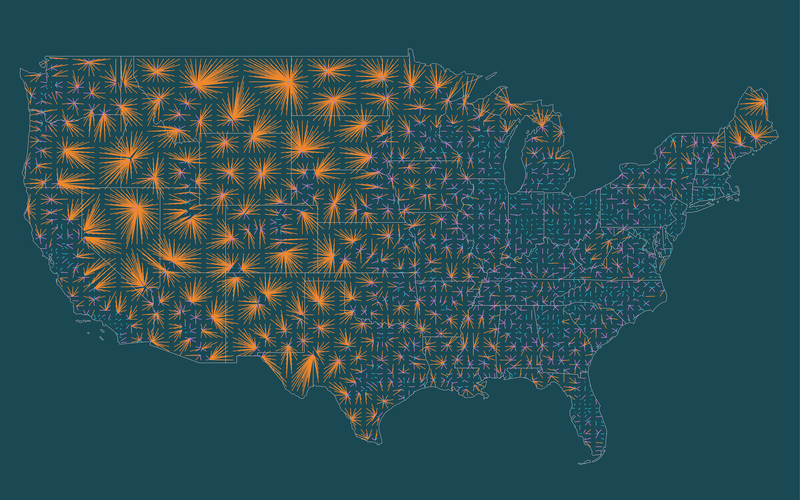 By contrast, sharp, pointy peaks of orange lines represent health care deserts — places where doctors are isolated, and patients have to travel long distances to receive care. In a lot of places, geographic barriers dictate the location of health care deserts. (It turns out many of them are in actual deserts — go figure!) But in other places, the barriers are invisible, taking the form of socioeconomic and market forces, which also play a role in the placement of doctors and hospitals. Often times these forces don’t align with the needs of the people. According to Amino’s data, there are approximately 48,000 OB/GYNs that practice in 22,000 locations across America. This is similar to the number of emergency medicine doctors (49,000 practicing in 16,000 locations). However, in many areas, women have to travel further to see an OB/GYN than an ER doctor, despite having more potential locations. (OB/GYNs tend to practice in a wider variety of facilities, like offices and clinics, while emergency medicine doctors tend to practice in hospital emergency rooms). This problem is particularly apparent in the rural southeast. If you train your eye on the southern and central parts Georgia, Alabama, and Mississippi, you’ll notice more longer, purple lines pop up for OB/GYNs than for emergency medicine doctors (and even longer lines for radiation oncologists). This area overlaps with what is often called the “Black Belt,” roughly 200 predominantly black counties in the South that have historically experienced acute poverty and poor health care services. If this visualization is any indication, unequal access to care continues to affect people who live in this area. This can have lasting effects for women in particular, since studies have shown that lack of access to obstetrics and gynecological care in rural areas have real consequences, like higher infant mortality rates. At Amino, we’re trying to paint the clearest possible picture of American health care. Part of that mission means figuring out where every doctor in America practices. Access to information about health care is also a significant challenge, and it’s our hope that sharing visualizations like these can help shed light on the problem. I like to draw charts & graphs. Data scientist at Coda & Resistbot.